Antlers come in all shapes and sizes. From typical main frame monsters to gnarly looking abnormal protrusions that seem to sprout and drop in every direction. One question that hangs in the balance is how some deer grow racks of perfect symmetry every year while others seem to take a different course. There are many cases in which a buck may grow a non-typical set of headgear and I will address those here for our readers. Most everyone realizes full well that when a buck is injured during the antler growth stage that this can create an abnormality in its antler development. It is readily accepted that if a main skeletal structure has been altered through any means, ie: deer/car collision, that the buck will grow a visibly abnormal appendage from the opposite side of the conflict. Lets put that into something easily understood using the deer/car collision as an example. Throughout deer country we receive many reports of vehicles hitting deer on our roadways every year. These reports escalate during peaks times of deer travel such as the rut. During the time of the rut a deers antlers have fully developed and in this case the trauma does not effect the immediate growth of antlers but, during the time of antler development, the story changes. In fact, a deer hit by a vehicle during this time of development stands a very good chance of irregular antler growth on the opposite side for that season if the collision has caused some sort of skeletal impedance. Point in case would be a deer breaks or fractures its rear left leg as a result of the accident. This deer survives and continues to grow antlers but on the opposite side of the injury, in this case the bucks right antler, would show visible signs that some sort of trauma took place during the development stage. There is a lot of speculation as to why this occurs but nothing definitive has been documented. In several studies researches and scientists have performed their own tests in search for continuity towards these claims. In one of these studies it was revealed that amputation of a bucks leg directly correlated with abnormal growth of the opposite antler each time the amputation was performed. Sound extreme? If the amputation test would have revealed definite results it would be a major breakthrough into understand this phenomona. During the time when antlers are in velvet they are extremly subject to injury of all kinds. Bucks take added caution to avoid conflict or contact whenever possible. Try as they may this is also a time where parasites and common woodland insects flourish in search of their next meal. Often on that menu you can find the blood-gorged antlers of the whitetail buck. Woodticks and insects that require blood to survive are commonly found on bucks that are in velvet. These are the most extreme cases where any type of malformity arises as the ticks themselves are so small in stature. Although not as visually noticeable they have been noted to disrupt the delicate nature of a bucks antlers during development and create mainly smaller abnormalities. Deer often take a couple years to develop into an animal capable of producing antlers of respectable size. Throughout their years they continue to develop in forward progression increasing in both body mass and antler size if enough nutritional intake is consumed to satisfy both requirements. In years where a buck may encounter slightly less than favorable food sources, or over-population becomes a problem, there will be a noted decrease, or possibly no gain at all in antler size from the previous year. This regression continues in subsequent years if in fact food sources are depleted and the deer do not alter their formula for survival. In any case the intake of nutrition will first feed the body before energy is routed towards antler growth. So what does this have to do with age? Very few people will actually view a free-ranging wild buck that has grown past its prime. In fact more times than not this same person is viewing a buck that simply has an under-developed set of antlers which could be due in cause from anything listed here in this article. A buck that has aged past its prime are rarely viewed but certainly not invisible to the human eye. As a buck ages its entire body changes to accomodate the process. Nutritional intake is used mainly to satisfy the requirement of survival and that begins with the body. As time progresses it becomes evident that antler development has declined as antlers are not actually conducive to survival. This reversal will nearly always account for a non typical pattern of antlers. Alternatively you may also notice other characteristics such as a swayed back, squinted eyes, and added white fur around the facial areas are present in deer that are declining. 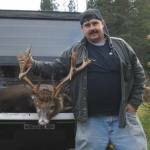 There are numerous diseases the can effect a bucks antler growth and cause abnormalities. These diseases do not have to be specifically related to the antlers such as CAS or Cranial Abscessation Syndrome. CAS is actually a brain abscess which can be derived through bacteria entering a wound in a bucks delicate velvet stage of antler growth. Signs of CAS include swollen eyes, broken antlers with visible fluid seepage, swollen ankles, foot sores, and lameness. Pus may be observed at the pedicle and the eye sockets. In effect, if this occurs during the velvet stage there will be an abnormal growth providing the buck survives through the entire antler growth period. Further yet it does not take a direct antler related disease to create a non typical set of antlers. Any disease that creates a hormonal imbalance can have a direct effect on the resulting antler growth for that particular animal. On a sidenote which documents a twist towards antler diseases, humans have been using antlers and velvet to treat our own diseases for many centuries. Contact during any time when a buck is sporting antlers can result in damage and thus creating a non typical set of headgear. For the most part this area will relate to those times when the event would be more pronounced which of course is during the antlers velvet stage. It doesnt take much of a hit, knick, bump, or fall, to change the course during this time of development. A simple low-hanging branch or sudden slip can create the necessary contact and result in deformation. The possiblities are endless to the point that they travel back in time to intentional practices some of which may still be used today. It was reported that in some countries such as Europe that land managers and private land owners would shoot fine birdshot at the deer. This practice was excerised while the deer were in their velvet stage of growth and vulnerable to contact. The idea wasnt to injure the deer but to force a non typical growth of antlers. It was reported on many accounts that this form of alteration created a sprouting effect of the antlers. Consequently this was the goal of the land owner as it drove a higher value towards the deers antlers for their abnormal proliferations. Contact that is both direct and indirect during development will create a high precentage that the same buck will retain visual evidence throughout its antler growth period. As with any deer genetics play a vital role in its future of antler growth as well as body development. Although this genetic blueprint can be altered through lack of nutrition, the basic benchmark has been placed well in advance. Whether or not a buck will achieve or succeed this benchmark depends on its own capabilities and the availability of necessary requirements such as quality food sources. Speaking in terms of geneticism a fawn will derive half of its genetic traits from both parents. A large non typical buck breeding each year does not constitute that you will see a high volume of similar deer in the future. In fact, through obvious calculation and herd ratios, we see that more often a doe is produced. Taking this a bit further we find that even if the doe gives birth to a buck fawn it still does not mean that this fawn will grow to be a non typical buck even though she was bred by a non-typical. In terms of percentages it is likely that the fawn would indeed become a non typical but such is not always the case. A doe that has bred with a typical buck can very well produce a non typical offspring. This is due to the previous mention that the fawn will derive its genetic map relatively equally from both parents with a given traits towards one side or the other. Further example. The doe that is breeding with the large typical racked buck was derived from a non typical father. This is a genetic trait that could be carried over from the female string of DNA and, if in fact her genetics traits are stronger or more pronounced in this area, it is quite conceivable to say that her offspring would carry a non typical rack providing of course it is a male. Its a common notion by hunters to adhere to the fact that if they have a big buck running the woods where they hunt that those genes will automatically be passed on. Chances are that may happen but in actuality you would also need to have the breeding doe documentation to make that statement with any authority. In any event a breeding non typical buck will most likely pass his genetic blueprint through a receptive doe at some point and time. Some interesting footnotes that also require noting is a bucks hormones. One might ask what hormones have to do with antler development in terms of non typical versus typical antlers so we thought we should wrap this up with a little added information on the subject. We know that hormones are required to create antler growth. This correlates with a rise in testosterone that begins shortly after birth and increases throughout the coming months before decreasing in the early winter months. In some cases we find that there is a hormonal imbalance. A doe may grow an entire set of antlers but never shed the velvet due to a lack of necessary testosterone. The same can hold true for bucks who experience the same type of imbalance but the effect on them may be different as their levels of testosterone drop dramatically before the cycle completes. Bucks in this scenario may retain their antlers in the velvet stage and not shed during that particular year. Subsequently the following year will embark where the previous year ended. This creates new growth on top of old growth antler which commonly results into what is referred to as a cactus buck where the antlers are more of a gnarled ball than true tines. Truely a non typical mess of mass but equally unique in its own right.